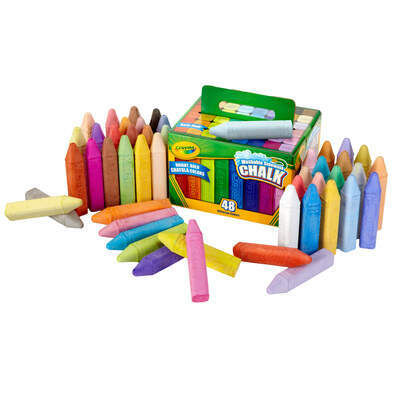 This pack of washable Crayola Playground Chalk is the perfect addition to your Nursery Arts & Crafts kit. They come in a range of assorted, bright and bold colours. Each one can be used to draw both fine and broad strokes, allowing children to let their imaginations run wild. As they are designed for younger children, these playground chalks have an anti-roll shape to prevent them from rolling away when placed on the ground. The non-toxic chalk is ideal for use on pavements and playgrounds. It can be washed away in seconds, clearing the way for further crafting in the future. Our Arts & Crafts category is specifically aimed at educational and residential environments. We have a wide selection of toddler art supplies including Gompels Washable PVA Glue and Ready Mixed Paints in every colour.